Chelsey Davis (left) is the likely replacement for Tammy Dombeck, who had been CBS11’s principal early morning interim traffic reporter until she announced on Monday that she was being let go. Tammy Dombeck, CBS11’s principal interim early morning traffic reporter since Whitney Drolen resigned in October of last year, apparently will end up being the bridge between two younger blondes. As tweeted Monday by Dombeck herself -- and as retweeted that day by your friendly content provider -- she’s been passed over for a job she very much wanted. “My friends, it is with great disappointment that I tell you CBS is not hiring me for the AM traffic spot. Tomorrow will be my last AM show,” Dombeck said. As it turned out, there was no tomorrow either. Dombeck thought her last day would be on Tuesday, April 28th. But after an outpouring of support for her on both Twitter and her Facebook page, Dombeck said CBS11 management contacted her attorney and said there’d be no need for her to come in on that day after all. So that’s that. CBS11 has not officially announced a full-time replacement for Dombeck and declined to comment any further “until there is news on that front.” Staff reporter Elizabeth Dinh will continue filling in for the time being and “we appreciate Tammy filling in for the past few months,” CBS11 director of communications Lori Conrad said via email Monday. 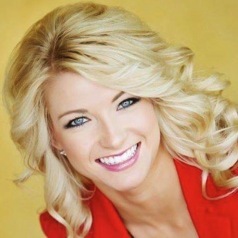 A number of sources, however, say that CBS11 has settled on Chelsey Davis, currently doing traffic reports for CBS affiliate KPHO-TV in Phoenix. Davis, a former Arizona Cardinals cheerleader and captain of the squad for two years, turned 24 on March 4th and also was in North Texas early that month, according to her Facebook page. Davis, who has been with KPHO since July 2013, also bills herself as a “freelance emcee” who graduated in May 2013 from the Walter Cronkite School of Journalism and Mass Communication. Dombeck, 42, began filling in periodically at CBS11 in March of 2013 before getting appreciably more air time after Drolen left. The station’s early morning team is still a work in progress, with former longtime P.M. co-anchor Karen Borta and meteorologist Scott Padgett the only current “permanent” members. CBS11 investigative reporter Jason Allen, the early morning interim co-anchor since Brendan Higgins was dropped in August of last year, will give way on June 1st to newcomer Russ McCaskey from Tulsa, OK’s KJRH-TV. The date of the new traffic anchor’s arrival is still unknown. Dombeck, of course, has been a part of this. As have Padgett, Allen and Borta, who in a surprise move joined the early morning crew on Jan. 12th after almost two decades of co-anchoring the 6 and 10 p.m. editions. Borta may be the straw that stirs the drink, but Dombeck has more Twitter followers than any of her A.M. colleagues in times when local news station executives virtually order their anchors and reporters to be productive “Social Media” citizens or face the consequences. At last count, Dombeck has 10,800 Twitter Followers. Borta has 7,116, Padgett has 2,836 and Allen has 2,457. Dombeck’s much younger and supposedly friskier replacement has a long way to go to catch the older gal. She currently has 1,634 Followers. Even Drolen, who benefited from CBS11’s heavy “Rollin’ with Drolen” promotional campaign, still trails Dombeck with 10,100 Followers. So what are Dombeck’s future prospects in the D-FW television market? Never officially hired by CBS11, she doesn’t have to deal with a 6-month “non-compete” clause that is keeping former longtime sports anchor Babe Laufenberg off the air until at least July. That’s a plus for her. But any possibilities as a full-time weekday traffic reporter probably come down to just one station. That leaves Gannett8, which is taking a beating in the 25-to-54 demographic and appears to have gained little -- and perhaps lost ground -- after making uniformed DeSoto police officer Nick Bristow its full-time early morning traffic reporter last August. All these months later, Bristow is clearly more comfortable on the job but still doesn’t stand in front of traffic maps the way his competitors do. It makes his reports seem remote in comparison. And Bristow isn’t blonde. He’s bald. Whatever happens, Dombeck has many Social Media sympathizers out there. And CBS11 can only hope that re-shuffling the early morning news deck not once, not twice, but eventually three times this year will not deter the momentum it’s built in recent months with the team of Borta, Allen, Padgett and Dombeck.